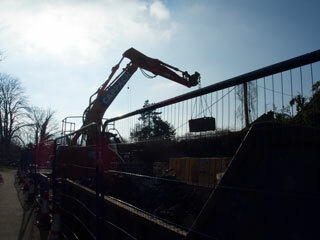 Railway electrification works underway at Radley Station, 18th January 2015. 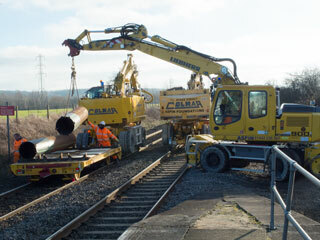 The picture shows hollow cylindrical steel piles being loaded onto the wagon that will convey them to the installation sites along the track. The piles will be driven into the ground alongside the railway, using the two machines on the track, to form the foundations of the gantries that will eventually support the high-voltage overhead cables. For more information, see http://www.aspingroup.com/brochure/aspin_brochure.pdf and http://www.aspingroup.com/aspin-foundations-rail.asp . Excavations underway in Church Road on 9th February 2015 to undertake major repairs to the sewerage system in Radley.